Run, don’t walk, to get this book! It is a practical guide to always getting a better outcome if you follow his advice. His advice makes so much sense, along with examples and the explanation of ‘why’ something worked. I most loved his examples of ‘use your late night DJ voice’ – and we all know what that sounds like. His technique of mirroring is spot on. I’ve been doing it for years, trained as a Transformative Mediator, which works just as he describes it. I was one of the first to study Fisher and Ury’s Getting to Yes before I graduated law school in 1982. Just as Chris Voss describes, this approach is so limited compared to what Chris recommends. I’ve been a Mediator (Florida Supreme Court Certified in Circuit Civil and Family) for over 12 years. My success is based directly on the principles Voss espouses. These work. Unless you’ve been a lead international negotiator for the FBI, this book will open your mind to the how’s and why’s of high stakes negotiating. We live in a world of conflict and the biggest obstacle for overcoming it is fear. What could be a higher stake then when gambling on one man’s life? Chris Voss, takes the reader to the threshold and then walks the reader through it. The words are simply, empowering. The mindset of the author is clear, the value of being a skilled negotiator will improve your relationships and position you to get the things which will impact your life and others around you. Voss draws you in with some requisite self back-patting and stories of famous negotiating failures in law enforcement. Lesson 1: Understand why people want, not what people want, most notably, people want to be understood and accepted. "Listening is not a passive activity. It is the most active thing you can do." Voss quickly recounts a hostage situation where it takes an entire team to listen to one person. Who would have ever thought? Voss reminds us that we may never have to deal with negotiating with a kidnapper or terrorist, but "life is negotiation." However, he goes on to explain that most of our daily interactions at home and work are a series of negotiations based on the universal urge of "I want." The title suggests rigidity most of us don't encounter in the workplace and Voss explains early that a hostage negotiator "has to win." He can't split the difference by agreeing to let the hostage taker hand over half their captives and dispatch the rest. But, for the rest of us his book reads with a combination of adventure and valuable lessons that we can adapt with a lot more flexibility than Voss ever could. This book has a lot of valuable material about negotiation regardless of whether you are an experienced or novice negotiator. I graduated from business school over forty years ago, and negotiation skills were not part of the curriculum. This book is invaluable for any old or new dog that wants to learn new tricks. The author helps the reader understand the psychology that is embodied in a negotiation. Negotiation should not be a clash of wills or butting of heads. According to the author, you have to give your opponent “illusion of control.” Know the difference between “you’re right” and “that’s right” responses. This is a book that needs to be read several times in order to be able to process and implement the strategies that the author provides. Great title that instantly made me want to read the book. I am a real estate agent as well as an investor, so negotiation is of utmost importance to me. I never want to split the difference as I want my price. Although negotiation is a part of life, I initially assumed this book would be about real estate investing so I was a little disappointed when the book opens with hostage negotiations. Although the stories about his hostage negotiations are interesting I got tired of them and wanted to get on with situations that would most effect my work. I was interested in reading this book because I use similar books in several of my classes. I wanted to see if there were any "new ideas" on an old and familiar topic - negotiating. The opening chapters grabbed my attention, since the author is very confident of his skills and tactics. He made a very interesting statement that the first step is getting over the common aversion to negotiating. I think most people are adverse to negotiating and feel that in order to be successful, you have to go in hard, in order to not appear to be weak. The author identifies several tactics, that on the surface, seem logical, such as using open ended, or calibrated, questions repetitively, as well as slowing the process down to buy time, shifting the frame of conversation from your counterpart's problem to solving your problem, the importance of listening, showing respect and the gathering of information. Other tactics highlighted include mirroring and labeling. I was intrigued by the concept, "The flip side of Getting to YES - the importance of getting to NO," since Voss feels that NO actually kick starts negotiations. and I agree that it has some merit. For a business book, surprisingly entertaining. This a great resource to prepare for, and then handle, negotiations for any type of matter. The techniques are well explained, and a prep-worksheet web link is included. Chris Voss presents solid strategies and approaches to negotiations that, properly applied, will secure the best possible outcome for you the Negotiator. In addition to picking up solid negotiating tools, I really enjoyed seeing how top experts used these tools to resolve high stakes transactions where lives were in the balance. I loved this book. Author Chris Voss did a great job of illustrating his points with compelling real-life stories, as opposed to simply relying on his reputation as a top-notch hostage negotiator to carry the book. He built in credibility along the way with his analysis of what went right AND wrong and was never afraid to admit when he or his team members made mistakes. He seemed intent on helping the reader learn from his experiences and that generosity of spirit comes through. Part of the reason this book works so well is that the strategies and techniques are based on human psychology, and as the description of the book points out, are "...field-tested tools for talking anyone into (or out of) just about anything." The examples used in the book directly illustrate HOW the tools and techniques work and in certain cases, explain why other approaches don't work. In the situations that went horribly wrong, Voss does a great job of conveying his utter sickness and horror at the lives lost and then is able to step back and explain how it happened like he did in the Burnham-Sobero case in Manila. His ability to debrief and provide lessons learned are invaluable to anyone in any career or in any relationship with other human beings. Voss does a great job of boiling every human interaction down to psychology. Without a shadow of doubt, this is one of those books once you have started to read you just do not want to put it down. But even before I had started to read, I was quite impressed with Chris Voss and his background. After all if anyone should know about negotiation, I can't think of anyone better prepared than one who is skilled as a hostage negotiator. Right away Voss points out the use of open ended questions as a tool to better negotiation. Sometimes this is also called calibrated questions. Whatever we choose to call them, they are questions that must be responded to but do not have a fixed response. NO canned answers here! Voss also points out his use of passive-aggressive techniques. He just keeps asking questions until he gets the other side to give up and give him what he wants. I was quite intrigued by Voss account of negotiation in history. He says that over time we found out that brute force just does not work. He shares examples where he says the brute force approach simply pushes the aggressor into the "nuclear option" and people die. Voss talks a lot about his negotiation training at Harvard. He says he discovered that we are not all "rational actors." So simply negotiating to maximize one's own value does not work. We find people are not fully rational or completely selfish and thus their actions are not stable or predictable. Over time negotiators found they had to be trained in quid pro quo bargaining and problem solving. Emotions and emotional intelligence were found to be keys to success. Voss introduced his concept of Tactical Empathy. Listening is key! Looking to influence behavior brings success when a negotiator can get into the mind of the other person. He says "Life Is Negotiation." I won't spoil it for you, GO READ IT! Trained negotiators know they can't stick with what they believe, they have to build several hypothesis and work hard to reveal the other persons surprises. Then comes another concept called Mirroring. It is called isoproxim and essentially is imitation. The language of negotiation is primarily a language of conversational rapport. Page 49 has a lot of Key Lessons worth checking out! Emotions will derail communications. We must be able to label the other person's pain, not feel it. If you are like me you are besieged with telemarketers and you detest them. Chapter 4 Beware "Yes"-Master "No" reveals a great approach you can use on these folks who are using the "Win at any cost approach" on you. Here comes the Behavioral Change Stairway Model. This is about behavior change, sometimes in life or death situations. Another MUST READ! Voss emphatically says the win-win approach used by many negotiators is usually ineffective and often disastrous. He cautions "Do Not Compromise." The section on being fair is very valuable. He says people are swayed by feeling they are respected. People comply with agreements if they feel they have been treated fairly and they lash out if they don't. A wonderful review of tactics to use in negotiation. These suggestions can be used in many contexts, eg buying a car, asking for a raise, or even in financial or legal arenas. Any one can benefit from the insight and experience that Chris Voss brings to the table. Having written a book about negotiation, I was very interested to see what Chris Voss, a former FBI international hostage negotiator had to say. Even though negotiating with labor unions was not as exciting as negotiating with ruthless hostage takers who might kill a hostage at any misstep, I was surprised that many of his principles were similar to my forty-one rules. For example, we both know the value of 1) being willing to apologize; 2) not negotiating against ourselves; 3) asking open-ended questions like, “How am I supposed to do that?”; 4) the use of silence in a negotiation; and 5) knowing how to negotiate with a crazy person. I learned a few new techniques, too. He suggests using a very specific number when negotiating. $2143.72 sounds like an accountant who has done a lot of number crunching. He showed how to renegotiate a lease with lower monthly rent by pointing out that the landlord’s increased expenses if he gets a new tenant and the apartment is empty for a month or more. I grimaced when I saw that when he bought his new “salsa red pearl” car, a written offer was given that said “You win” with smiley faces on it. I also got the smiley faces and “you win” message for my new blue Ford Escape. Of course, Voss did not take the bait and got the deal he wanted. However, since this was the third round, I foolishly took the “I win” offer. I wonder how many other car buyers get those smiley faces. Enjoyed reading this book a lot. From the very literal sense involving police negotiations through just everyday personal situations. Everything from having a spouse talking down a potential suicide victim from a steep overhead ramp on the interstate to being involved in police work myself for 36 years, the incidents are very relatable. Also, over the years I have been able to (if need be) walk away from potential personal business transactions. These include things like buying a new car & being able to call the salesman's bluff and letting a real estate transaction simmer on the back burner until the other party comes around to your terms. 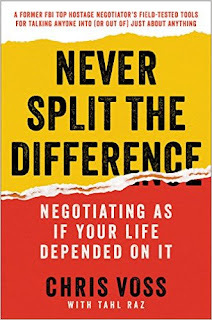 Never Split the Difference is a book that truly makes sense of the art of negotiating to the general person. It first grips the attention with anecdotes of negotiations and the styles used to acquire the desired outcomes. The author provides some helpful tips on voice inflection, use of Tactical empathy, and role playing. It builds anticipation in the beginning until the reader is transfixed and determined to master the art. This type of anticipation continues throughout the book. I found myself salivating at the prospect that this book would make me a world class negotiator and it certainly delivered. This should be required reading in every business class. Lots of information on negotiation styles and techniques and offers great insights into the human mind. Even provides negotiation dialogues for every day situations. I found the key lessons from each chapter very useful in breaking down a book packed with real life experiences in mastering the art of negotiating. Practice and preparation are key in how we use our time to process the information to get what we want. What I also found helpful from the book was the author’s breaking down three style type’s from the “methodical analyst”, “sociable accommodator” and the “assertive- wanting to be heard”. Each puts their own value on what’s important and can determine success or failure. Engaging and focused. Voss does an incredible job of keeping a steady flow from the very beginning. It is a perfect layout for attention challenged readers. He tells an interesting story, then what to do, what not to do, why, and closes each chapter with the highlights. Before reading this book I thought of negotiating as a given in all of our human interactions, and although it is, I now realize it is a set of skills that can be honed with practice, especially for those people to whom it doesn't come naturally. I am average at best. The ability to put oneself in another person's shoes and see the world through their eyes depends on one developing those skills that Voss sets forth: mirroring, calibrated "How" and "What" questions, using a label to build empathy, and/or to extract more information, smart anchors, saying "No" without using the word explicitly, face time with your counterpart, non-round numbers, listening which Voss emphasizes that, far from what we have been led to believe, it is not a passive activity. That what we're looking for is not problem-solving but a people mover took me by surprise because I am a high school teacher and it is what I instinctively do with my students. Since I am a lone figure in the classroom as their teacher, there is no room for good cop versus bad cop positions. I have to be the one the rely on inside those four walls as well as being a supportive friend off the clock as situations may dictate. It is the emotional climate this book emphasizes is key to negotiating, one the school system must realize is the true foundation for learning. We need authentic, *emotional*, sensitive schools. You can find several items you can apply right away and start seeing results immediately. One good way to read this book would be to read one chapter at a time, then try and use some of the concepts before moving on to the next chapter. Some of the best techniques are around mirroring people’s words. This is an easy concept to start with, by simply repeating back what the other person said. When this is done, the other person will slightly reword what they said, giving you the ability to tailor their words in a way that helps your side of the negotiation. The book is divided into sections that first start with a type of role playing exercise based on Chris Voss’ real life experiences, then uses that to explain the concept to apply to your negotiating role. About the only negative I had with the book is that Chris Voss spends more time writing about his experience than he does at actually explaining how to apply the concept to business negotiating. On the other hand, there is no filler in this book. The author uses every word purposefully. Chris Voss is truly the expert in negotiating. If anyone knows the expertise in life and death situations as well as business decisions, Chris is the one to call upon. Chris's personal stories about his negotiations through out the world in real life situations leave you speechless and wanting to read more. Chris has a way of transforming his knowledge and experiences into a manual of how to negotiate any type of situation in business and personal life with a new way of thinking.